The three-dimensional map is therefore a valuable aid to the examining ophthalmologist or optometrist in Edgewater and can assist in the diagnosis and treatment of a number of conditions; in planning refractive surgery such as LASIK and evaluation of its results; or in assessing the fit of contact lenses. A development of keratoscopy, corneal topography extends the measurement range from the four points a few millimeters apart that is offered by keratometry to a grid of thousands of points covering the entire cornea. The procedure is carried out in seconds and is completely painless. An Optical Coherence Tomography scan (commonly referred to as an OCT scan) at our Edgewater office is the latest advancement in imaging technology. 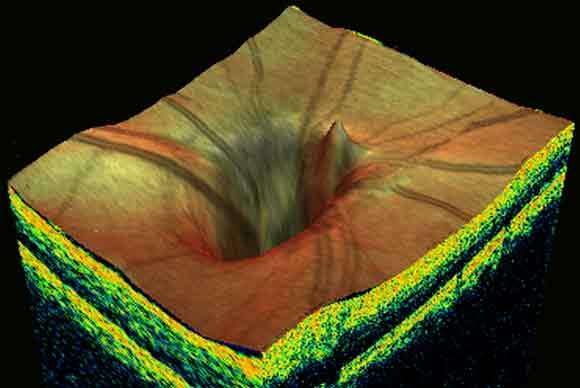 Similar to ultrasound, this diagnostic technique employs light rather than sound waves to achieve higher resolution pictures of the structural layers of the back of the eye. Annual eye exams are critical to maintaining your vision and overall health. We offer the iFusion Retinal Exam as an important part of our eye exams. The iFusion Retinal Exam produces an image that is as unique as you fingerprint and provides us with a wide view to look at the health of your retina. The retina is the part of your eye that captures the image of what you are looking at, similar to film in a camera. – the opportunity for you to view and discuss the iFusion image of your eye with your doctor at the time of your exam. – A permanent record for your file, which allows us to view your images each year to look for changes. 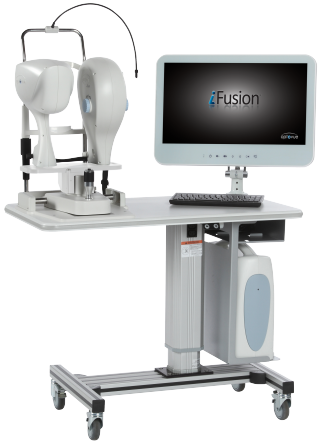 The iFusion Retinal Exam at our office in Edgewater is fast, easy, and comfortable for everyone in the family. To have the exam, you simply look into the device one eye at a time and you will see a comfortable flash of light to let you know the image of your retina has been taken. The iFusion image is shown immediately on a computer screen so we can review it with you. Please schedule your iFusion Retinal Exam today!